All signs point toward a wide-open race at Tour of Flanders with favorites like Sagan and Van Avermaet facing off with up-and-comers from the 'cross scene. 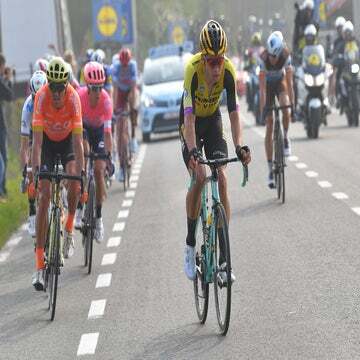 GENT, Belgium (VN) — A few key names confirmed they’re racing Sunday’s Ronde van Vlaanderen as the big favorites stretched their legs Thursday in final-hour recon rides. Anticipation is growing for Sunday’s big battle, which is expected to be one of the closest and hard-to-predict editions in years. CCC Team was among several squads who hit out on the bergs Thursday as favorites blew out the cobwebs ahead of one of the biggest dates on the international calendar. 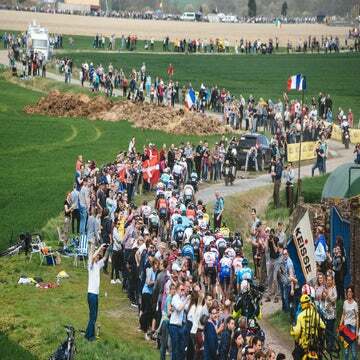 Fans and journalists followed teams on their traditional parade of key sections of the Flanders route. Van Avermaet was among a handful of top favorites who skipped Wednesday’s mid-week classic at Dwars door Vlaanderen, won by world cyclocross champion Mathieu van der Poel (Corendon-Circus) in dramatic fashion. Peter Sagan (Bora-Hansgrohe), Zdenek Stybar (Deceuninck-Quick-Step), Wout van Aert (Jumbo-Visma), Matteo Trentin (Mitchelton-Scott), and John Degenkolb (Trek-Segafredo) were among the other top names not racing Wednesday. One rider who did race Wednesday was Gent-Wevelgem winner Alexander Kristoff (UAE Team Emirates), who is showing hints of the same form he carried to victory at Flanders in 2015. There were a few updates to rosters Thursday as teams finalized their starting lineups. World champion Alejandro Valverde confirmed Thursday that he’ll make his long-anticipated debut. Deceuninck-Quick-Step’s Philippe Gilbert, who won in 2017, brushed off a stomach virus that saw him abandon Wednesday, and said he would not miss the most important date on the Flemish calendar. Gilbert’s confirmation means Deceuninck-Quick-Step will line up with its dominant roster largely intact from 2018, with Bob Jungels replacing defending champion Niki Terpstra, now on Direct Energie. Sep Vanmarcke, however, missed a recon ride with his EF Education First teammates Thursday. The eternal Belgian hopeful crashed out of E3 BinckBank Classic and missed Gent-Wevelgem and Dwars nursing a sore knee and other injuries. He will try to complete a training ride Friday when team officials will make a decision on whether or not he can start. Oliver Naesen (Ag2r La Mondiale), who’s been on top form with podiums at Milano-Sanremo and Gent-Wevelgem, could be a question mark. The rising star told Belgian TV that he is taking antibiotics to treat a sore throat, something he blamed on a chill he got after dousing himself with champagne on the winner’s podium Sunday. 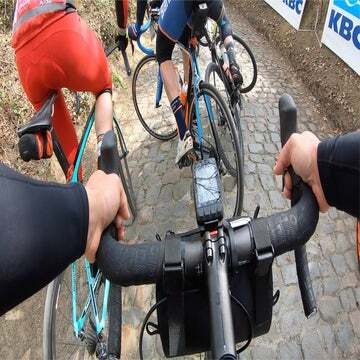 This year’s Flanders should see an exciting race, with traditional favorites like Van Avermaet, Stybar, and Sagan beating back a younger generation led by the cyclocross duo of van Aert and van der Poel. Both have been on top form this spring and will be among the marked wheels Sunday. Forecasters are calling for mild weather, with partly sunny skies in the mid-50s, and northerly winds. The VIP tents are already in place. The party will soon commence.